Home Headlines Conan GM Screen, Tile Sets, Bag and More! Conan GM Screen, Tile Sets, Bag and More! Today we’re really pleased to bring you a set of fresh releases from our Conan: Adventures in an Age Undreamed Of RPG, with a Gamesmaster Screen, four exciting tile sets, a double poster map and the limited edition Conqueror’s Bag, a wealth of goodies to fuel your adventures in the Hyborian Age. The Conan Gamesmaster’s Screen & GM’s toolkit is available for the first time in physical form, and features a sturdy four-panel build has four portrait-oriented panels, contains all of the useful tables and charts from the core rulebook, as well as rules summaries for quick reference. May also double as a shield from arrows, thrown tankards or ale horns, and even hatchets! 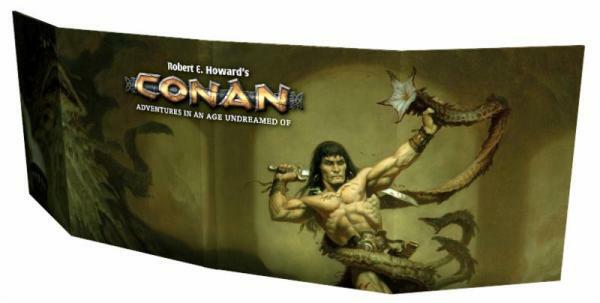 The Conan Gamemaster’s Toolkit which comes with the screen inspires the creation of thrilling plots, unforgettable characters, and unexpected twists in the vein of Robert E. Howard’s singular vision. 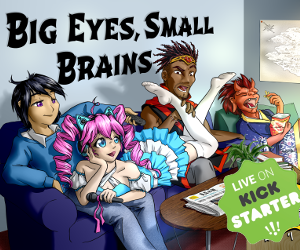 Generate ideas for exciting action set-pieces, antagonists, scheming machinations, and weave them into a story all your own. You can also expand your Conan Adventures with these four geomorphic tile sets which provide the perfect tabletop furniture for your Conan adventures. Featuring Dens of Iniquity & Streets of Terror, Perilous Ruins & Forgotten Cities, Fields of Glory & Thrilling Encounters plus Forbidden Places & Pits of Horror, these four high quality card sets feature a full colour laminated finish, and are reversible 16 tile set card set (8 x large and 8 x half size) marked with movement spaces to match the Conan boardgame by Monolith! Collect all your Conan books and accessories in one place in this high quality leather and canvas Conqueror’s Bag with the symbol of Mitra and the sword from “The Phoenix in the Sword” stamped in to the leather. This deluxe bag is large enough to hold the core book and a variety of other game aids, as well as serving to broadcast to the world that its owner is a true barbarian. Perfect for a roleplaying session or for stylish convention wear. You might also enjoy a new update from our friends over at Conan Exiles which is an open-world survival game, available through Steam Early Access. 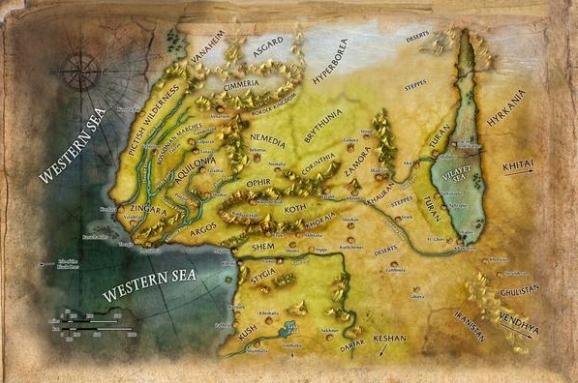 You must fight to survive, build and dominate in the harsh exiled lands. Conan Exiles is being continuously updated and now includes new expansion update The Frozen North.